James W. C. Pennington, 1807-1870 The Fugitive Blacksmith; or, Events in the History of James W. C. Pennington, Pastor of a Presbyterian Church, New York, Formerly a Slave in the State of Maryland, United States. 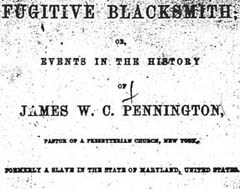 The Fugitive Blacksmith; or, Events in the History of James W. C. Pennington, Pastor of a Presbyterian Church, New York, Formerly a Slave in the State of Maryland, United States. African American blacksmiths -- Biography. African American Presbyterians -- New York -- Biography. Presbyterian Church -- Clergy -- New York -- Biography. Slavery and the church -- United States. Slaves -- Maryland -- Social conditions. University of Texas of the Permian Basin provided the text for the electronic publication of this title.